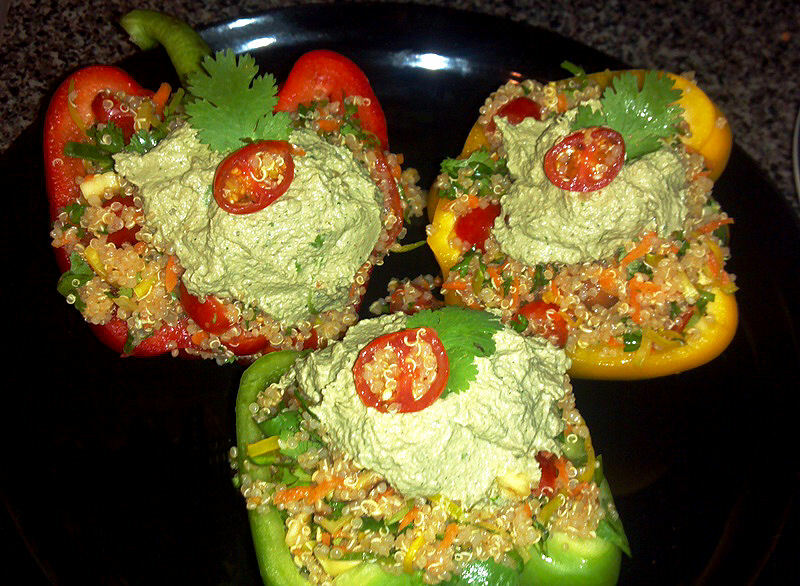 These are stuffed with a quinoa salad, and if you are familiar with quinoa, you know you have to cook it. 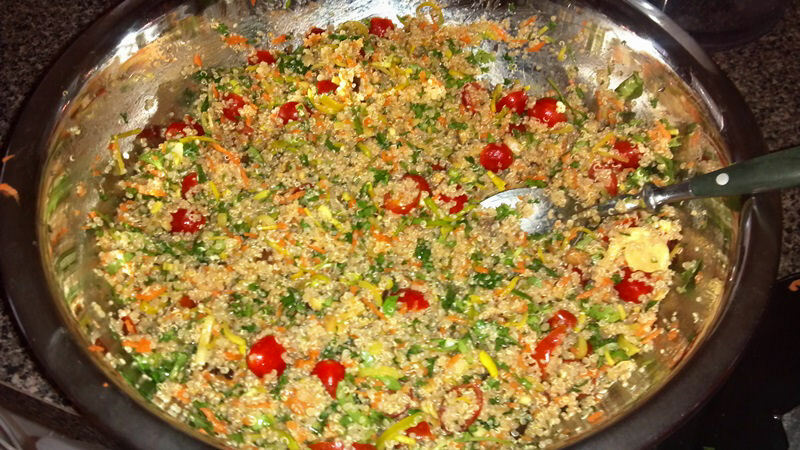 This is one of the few grains and vegetables that I do eat cooked, as quinoa is soooo good for you, full of iron, protein, magnesium, calcium, fiber and more! Plus, it tastes amazing in salads, as a side dish or just by itself as a sweet or savory snack! 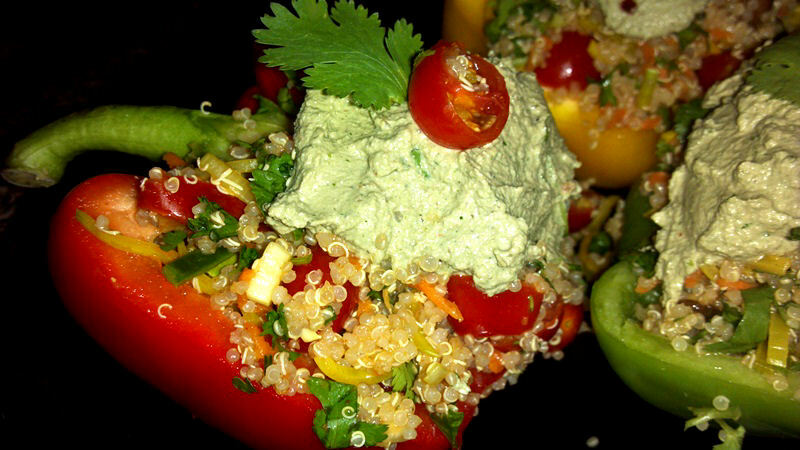 If you do make this recipe, however, there are a couple steps you have to do in preparation for the stuffed peppers, such as boiling the quinoa and marinating the mushrooms. So make sure you plan this accordingly and give yourself about 2 to 4 hours of prep time. – 4 cups quinoa, soaked for about an hour, then boiled with 8 cups water. You cooked quinoa the same way as rice, 1 part quinoa to 2 parts water, then boil until the water has evaporated and little white sprouts appear. Simple! As a side note, you can actually make less quinoa if you want, but I also use this as a great salad, so it’s perfect for leftovers to add to a salad for the next day, or to eat a side dish. 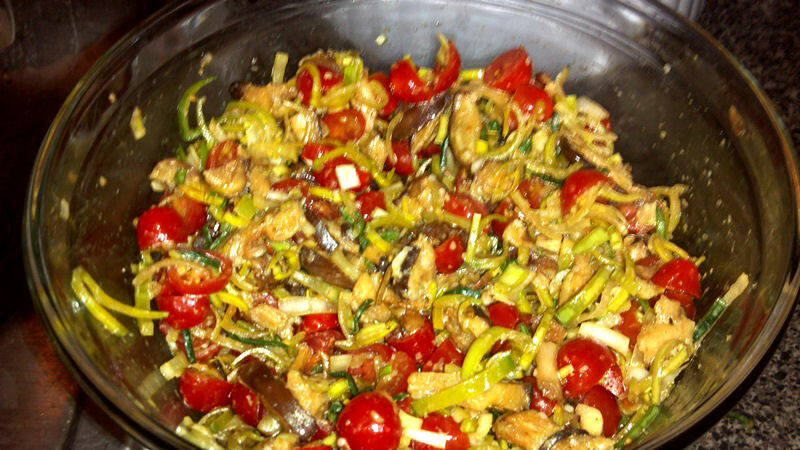 Chop the vegetables and add to a large bowl. 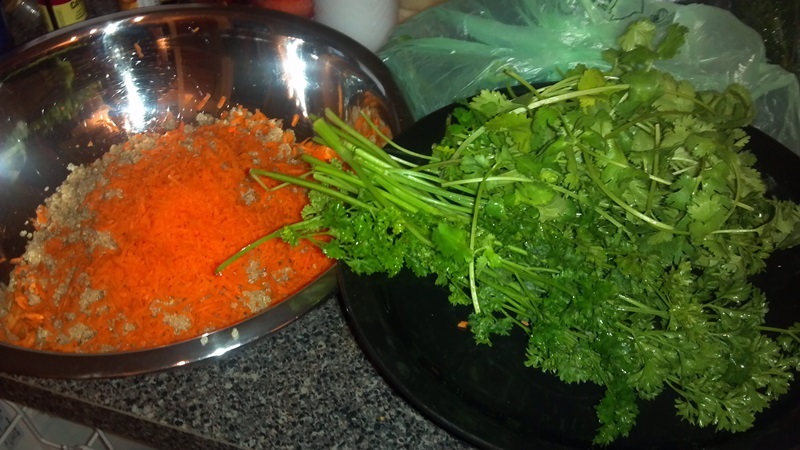 Mix in the hemp seeds, sesame and nutritional yeast, then set aside to prepare the marinade. You can eat this plain as a full meal, or add to a salad, there are so many options of what you can do with this dish alone! We are now ready to begin stuffing! 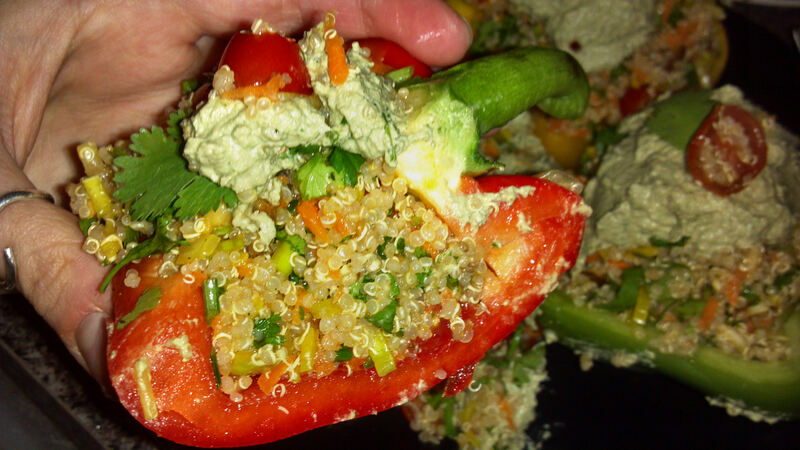 Start by spooning out the quinoa salad, and stuffing it into the peppers. Really pack it in there so you can get as much stuff in the pepper as you can. 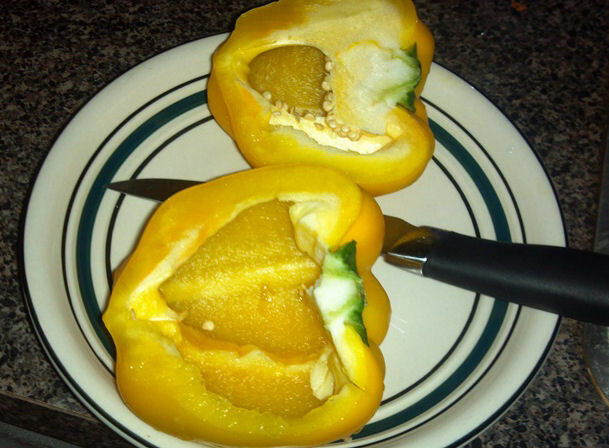 Let it overflow too, you want to have a large feast of raw stuffed peppers to eat! Hope you enjoy this recipe! I’m going to go finish my stuffed peppers now! 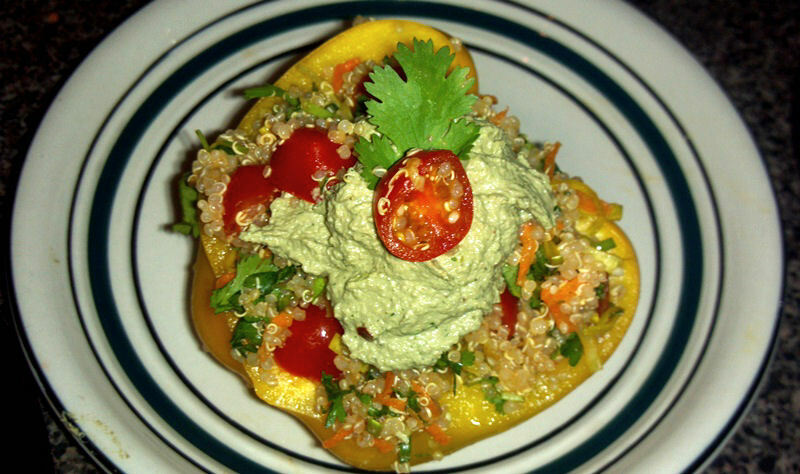 The fresh, sweet crunchiness of the peppers combined with the lemony quinoa stuffing and the creamy basil pesto gives a fresh, tangy taste like never before! I didn’t even bother with a knife and fork…as you can see, I picked up the whole thing and ate it like a sandwich…yummm! !